Christmas is almost here! 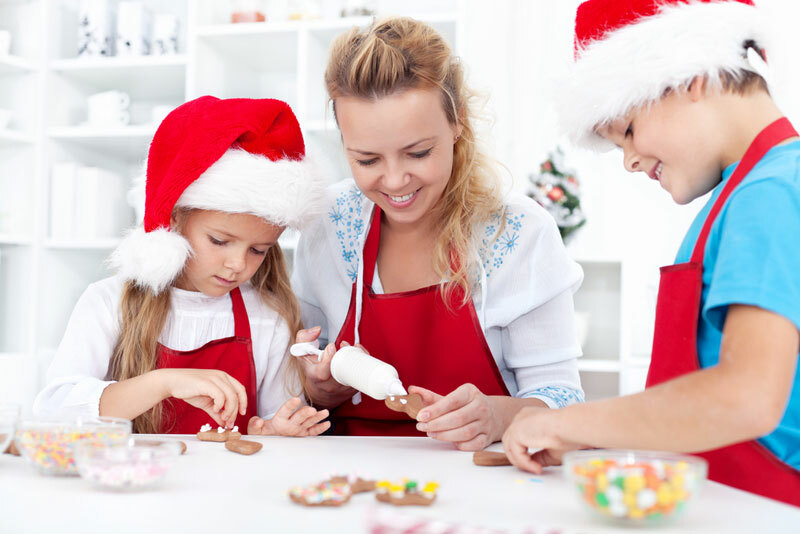 If you're looking for some fun activities you can do with your kids to keep them busy and to get into the holiday spirit, we've found some amazing, easy, and eco-friendly ideas for you from crafters and bloggers around the web. From adorably festive cookies to ornaments to hang on your tree or give away, here are seven last minute Christmas crafts to do right now! 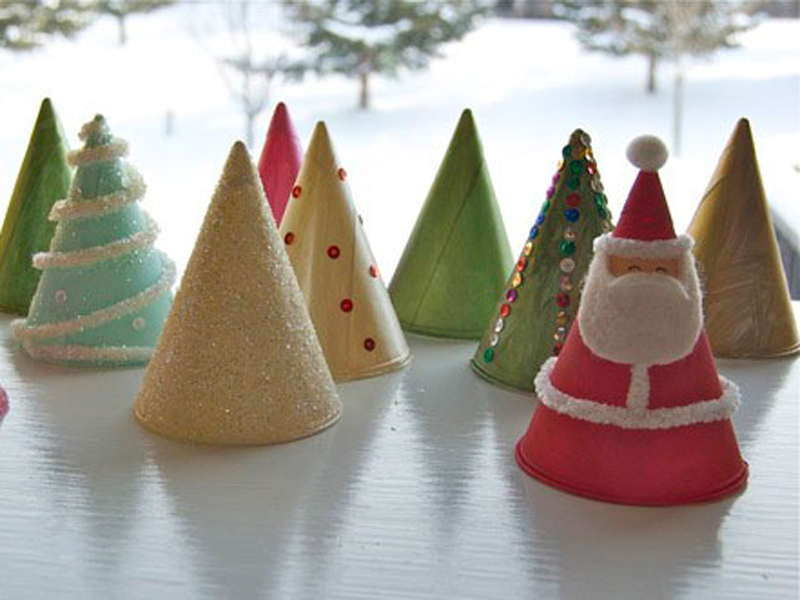 Using an old mailing tube or gift wrap tube, Yeri Yun crafted a DIY version of traditional Christmas Crackers. But as anyone who’s ever cracked a cracker knows, the best part is what’s found inside. So Yun cleverly created these crown-wearing peanuts to hide inside. Try her how-to instructions to make crackers for your Christmas table — even if you don’t spend the time to make such perfect little peanut figures, you and your family will surely have fun making your own version. All you need to make these simple flower ornaments are a few toilet paper rolls and a stapler. They’re beyond easy to make and even if your kids are too young to cut and staple, you can assemble a few ornaments, and then set your kids free to decorate them with glitter, markers, or any stray craft supplies you have around the house. With silver glitter or cotton balls they might even resemble snowflakes instead of flowers. If you have a few old, worn down crayons you can make some pretty fantastic wrapping paper. These easy instructions explain how to transform old tissue paper by ironing and melting on crayon chips. 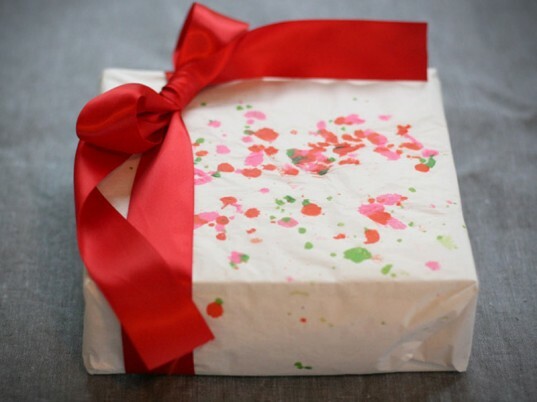 Your kids will love helping with this project too, from making the crayon shavings to sprinkling them on in fun and colorful patterns to unwrapping the gifts of course! Maya*Made’s milk carton homes are nothing short of showstopping. Cover them with brown craft paper to create a blank canvas and then paint the town — a whole town of carton houses that is! We’re certain your kids will love playing make-believe with these houses and their toys, but they also can be used to gift cookies for the holidays. Here’s a crafty project you can eat! Making Melted Snowman Cookies is easy following Crazy Domestic’s instructions. Just replace a few organic ingredients. Make your favorite organic sugar cookie recipe, use homemade marshmallows, and make colored icing using natural food dyes. Fun and yummy! We love these Felt Monogram Ornaments because they also double as gifts and/or gift toppers. While this project is more of a craft for you — it requires a bit of simple sewing and cutting — you can still enlist your child as your assistant. She’ll be happy to help you by choosing colors and stuffing each one. Ohdeedoh calls this the “easiest Christmas craft ever.” And we have to agree, it’s a super-simple project that, with any luck, could keep your kids busy for hours so you have time to wrap gifts, make a pie, and clean before Grandma and Grandpa arrive … well, maybe that’s dreaming! But, hand over a few lightweight paper cone cups and a pile of whatever craft supplies you have — yarn or fabric scraps, glitter, sequins, old buttons, markers, paint, etc. Then just wait to see what your kiddies come up with! 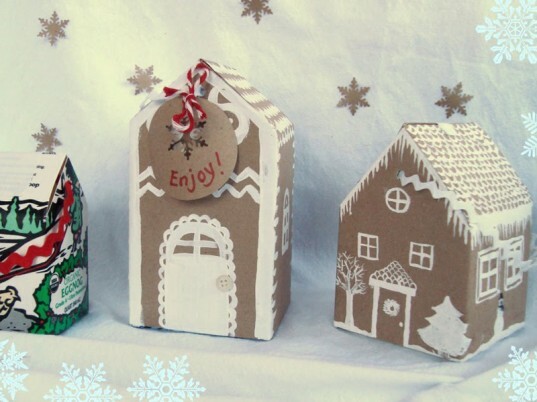 Using an old mailing tube or gift wrap tube, Yeri Yun crafted a DIY version of traditional Christmas Crackers. But as anyone who's ever cracked a cracker knows, the best part is what's found inside. 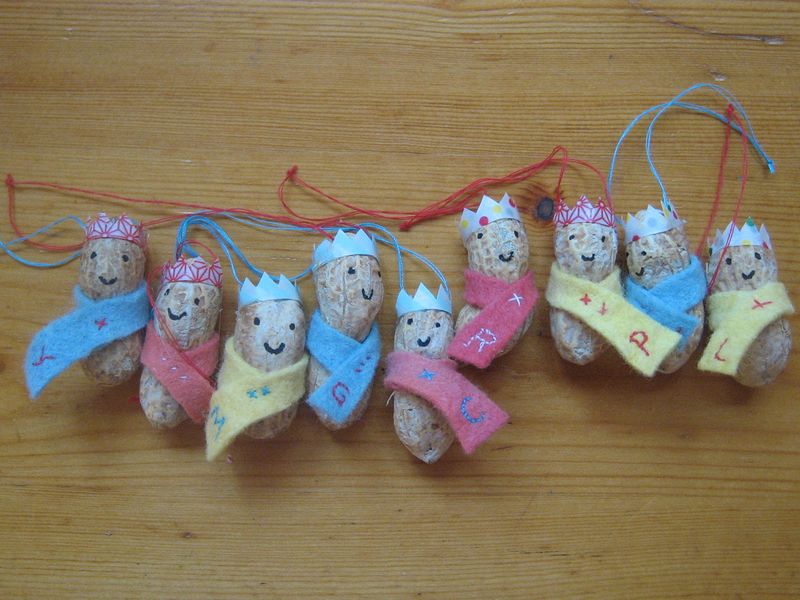 So Yun cleverly created these crown-wearing peanuts to hide inside. Try her how-to instructions to make crackers for your Christmas table -- even if you don't spend the time to make such perfect little peanut figures, you and your family will surely have fun making your own version. 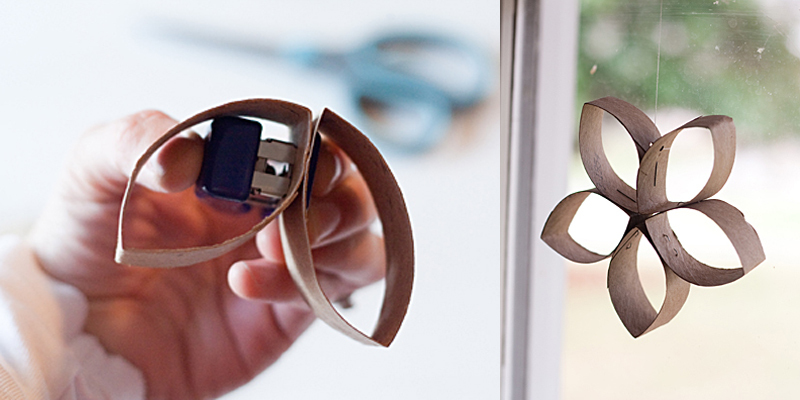 All you need to make these simple flower ornaments are a few toilet paper rolls and a stapler. They're beyond easy to make and even if your kids are too young to cut and staple, you can assemble a few ornaments, and then set your kids free to decorate them with glitter, markers, or any stray craft supplies you have around the house. With silver glitter or cotton balls they might even resemble snowflakes instead of flowers. Here's a crafty project you can eat! 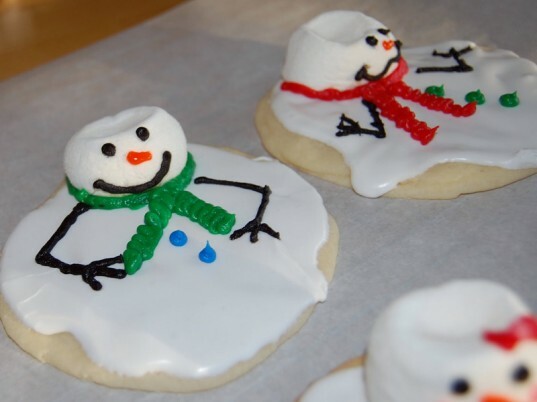 Making Melted Snowman Cookies is easy following Crazy Domestic's instructions. Just replace a few organic ingredients. Make your favorite organic sugar cookie recipe, use homemade marshmallows, and make colored icing using natural food dyes. Fun and yummy! 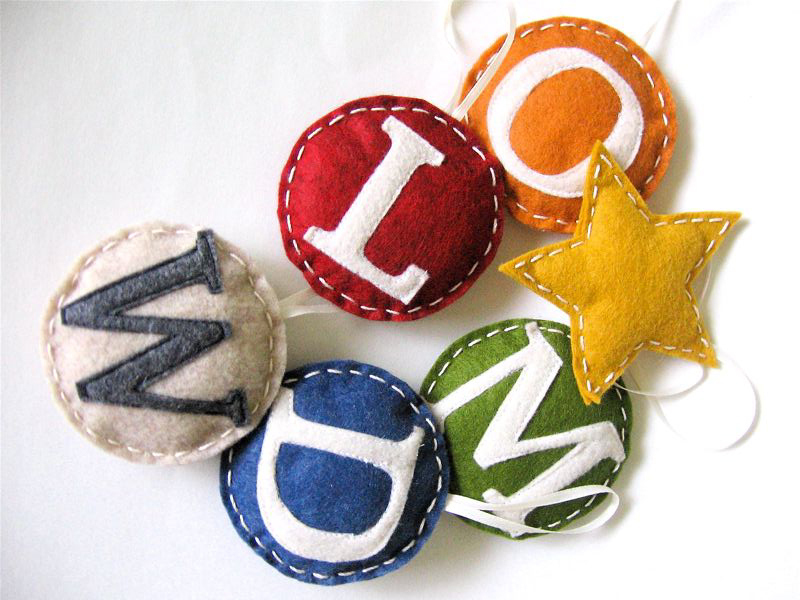 We love these Felt Monogram Ornaments because they also double as gifts and/or gift toppers. While this project is more of a craft for you -- it requires a bit of simple sewing and cutting -- you can still enlist your child as your assistant. She'll be happy to help you by choosing colors and stuffing each one. Ohdeedoh calls this the "easiest Christmas craft ever." And we have to agree, it's a super-simple project that, with any luck, could keep your kids busy for hours so you have time to wrap gifts, make a pie, and clean before Grandma and Grandpa arrive ... well, maybe that's dreaming! But, hand over a few lightweight paper cone cups and a pile of whatever craft supplies you have -- yarn or fabric scraps, glitter, sequins, old buttons, markers, paint, etc. Then just wait to see what your kiddies come up with!